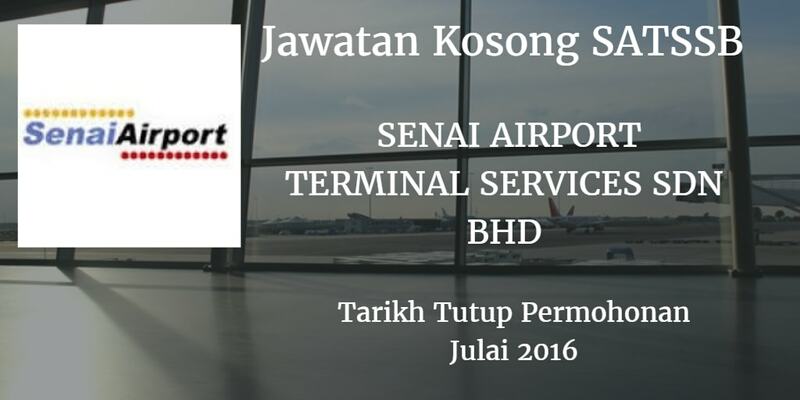 SENAI AIRPORT TERMINAL SERVICES SDN BHD (SATSSB), Johor membuka peluang pekerjaan terkini bulan Julai 2016 ini. Rakyat Negeri Johor Darul Ta`zim atau Warganegara Malaysia yang berminat kerja di SENAI AIRPORT TERMINAL SERVICES SDN BHD (SATSSB) dan berkelayakan dipelawa untuk memohon sekarang. Excellent oral and written communication skills in English and Malay. Excellent customer handling and service skills. Demonstrate multi-tasking abilities. customer follow-up and be a self-motivator. Responsible for resolving customer requests. questions, and needs ensuring the best use of resources to accomplish these tasks in a high pace environment. Must be able to handle customer complaints and maintain an understanding and professional attitude, even when handling unpleasant customers. To assist in monitoring cleanliness and maintenance of the Senai AirportTerminal. Responsible to ensure that all the Senai Airport Terminal‘s equipment and facilities are in a good condition. functions and serviceable. To assist in gathering live information such as estimated time arrival(ETA). Estimated Time Departure (ETD) and Flight Information Display System (FIDS). Maintain a pleasant, friendly and outgoing attitude.